Who Will Fight Canelo Alvarez? 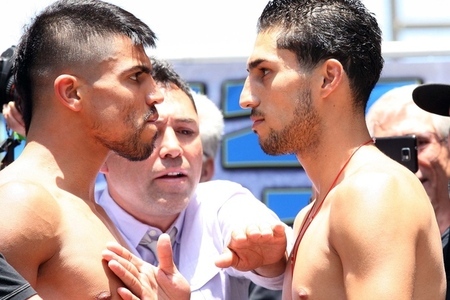 Last night the sport of boxing hosted the Victor Ortiz/Josesito Lopez battle. The goal was simple for Ortiz; defeat Lopez to set up a PPV battle with Saul Canelo Alvarez. Ortiz was originally scheduled to fight Andre Berto but a positive test for performance enhancers derailed that fight and in came Josesito Lopez as a replacement. Well things didn’t pan out so well in a great fight as Victor Ortiz’s jaw was broken by Lopez causing Ortiz to retire on the stool after the ninth round. This decision has put the September 15th mega fight with Alvarez in serious jeopardy. Who would you like to see Canelo Alvarez fight now that there seems to be a lack of an opponent? This entry was posted in Sports, TV and tagged Andre Berto, Blended Entertainment, Boxing, Entertainment, Lopez, Pay-per-view, Sports, Victor Ortíz. Bookmark the permalink. ← Is It Time to Officially Coronate Lebron James?